I am often asked this simple question by parents. And I have a simple, but not very satisfying, answer- it depends! There are a few problems that I would correct even in a 5- or 6- year old. 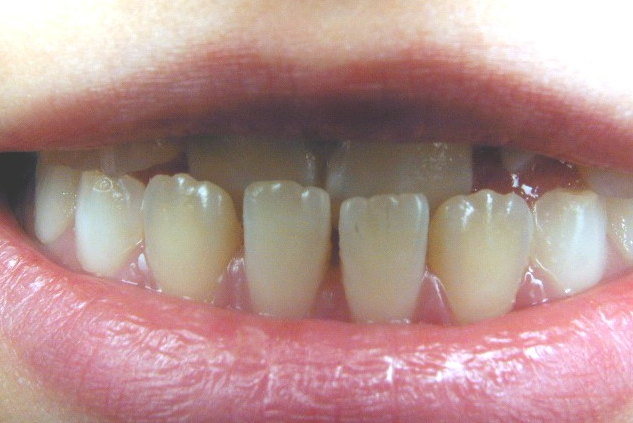 These are “crossbites”, where either the upper front or back teeth are locked inside the lower teeth. If left uncorrected, cross bites will soon make the child’s jaw grow abnormally crooked or long. Often such abnormal growth may be remedied only by extensive surgery later in adulthood! This child of 8 has her upper incisors locked behind her lower incisors in crossbite. 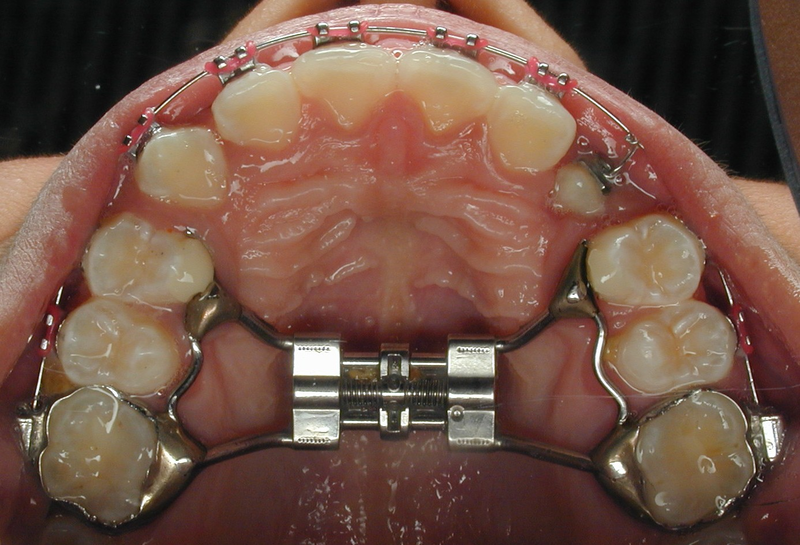 If untreated, this will become a very complicated surgical-orthodontic case. Another important interceptive strategy in children this young is to stop thumb or lip sucking habits, or modify the way the tongue moves during swallowing. Teeth can be moved into very unnatural positions by unusual tongue, lip, or finger habits. If not corrected early before orthodontics, tooth movement will not be stable. Many things we do at an early age can minimize or even prevent your child’s need for braces. The most important is keeping baby teeth in the mouth until they are ready to come out. Pulling back baby teeth early has severe consequences. It is guaranteed to cause the need for complicated orthodontics later! The earliest age we usually treat children orthodontically is age 7 to 9. This is called “Phase I treatment.” We can make most of the corrections in difficult cases here, leaving only a little to do when all the permanent teeth come in at age 12 to 13. There are many advantages to Phase I treatment. The most important are that children this age cooperate better, orthodontic corrections are easier and more stable, and we can more often avoid extractions of permanent teeth. The most common Phase I treatment we do is expansion of the growing arches, to make sufficient room for eruption of the permanent teeth. This child had a narrow palate, making it impossible to erupt the permanent canine teeth. A “Hyrax” ex-pander was placed in the roof of her mouth. Over the course of several days the device was expanded, until there was enough room to bring the impacted teeth into the arch. Usually too many teeth are erupting at age 10 and 11 to do fixed braces. All we can do is place space maintainers to preserve every bit of space as the last baby teeth are lost. This age may still be a critical time for treatment, as far as growth alteration is concerned. Some girls are nearly finished with bone growth at the end of their 11th year. Age 12 and above, when all permanent teeth are in the mouth, has been the traditional time of most orthodontics. Most Phase I cases need final correction at this age. However, even this is variable. I do not know why, but many children are getting all the permanent teeth in the mouth earlier. I am now able to put complete braces on some 11 year- olds and finish the treatment by age 12. A critical event occurs at age 18. Two bones in the roof of the mouth fuse together, and no longer can be expanded easily. It is at this point that orthodontics can really be slow going! One of the many advantages to your child’s treatment in this practice is my many years of experience doing orthodontics, beginning in 1987. At each dental checkup, we monitor your child’s growth and tooth eruption. In fact, I spend more time doing this than checking for cavities! We will alert you to critical times for possible orthodontic intervention, so your financial outlays and time in braces can be minimized.